Just passing through; on our way home from Yellowstone. The staff was friendly. Our only complaint was that the RV sewage receiver was not threaded for our FHU site. And one of us had to stand on the elbow during dumping to ensure a safe and successful event. Site was level; high water pressure...bring a pressure regulator, always. Close to restaurants and fueling stations. May stay here again for an overnight. We camped at Sioux Falls KOA in a Travel Trailer. This is a resort version of the KOA's; very large layout and activities. We were only passing through to get in Mount Rushmore and the town for a day as we were working our way home. The site was a pull-thru; however, it was not long enough for the tow vehicle and the travel trailer to be end-to-end as with most sites of this type. Instead, most campers were parking their tow vehicles in the grass of their campsite; the staff never complained. This was a bit pricey; but, there were many features that we did not take advantage of that would have helped justify the cost. The campground, bathrooms and showers were clean and well-maintained. We would likely stay here again; it is a very short drive to Mount Rushmore and for shopping in town. We camped at Mount Rushmore KOA at Palmer Gulch in a Travel Trailer. The lighting ceremony is nice; they turn the lights off of Mount Rushmore promptly at 11:00 PM. This was an overnight stay; we wanted to include the Devils Tower monument on the way home. We arrived later in the day; so, we didn't get to take advantage of some services and amenities. The overall campground appeared clean and managed well; the staff was helpful with providing information and answering our questions. This place gets very full of campers; so, make reservations. Check-in went quickly; afterwards as staff member escorted us to our campsite. The sites were level; and the full-hookups were in good shape. He pointed out the various facilities. We found the bathrooms and showers to be reasonably clean and maintained, considering how many campers were there. We did our laundry; the washers ($2.25/load) and dryers ($2.00/cycle; needed to run twice for most loads) were in good working condition. They had two laundry facilities; the one furthest from the park office had more machines. They had live music around a community campfire. You are literally sleeping at the foot of the Devils Tower at this KOA; which adds a very nice touch to staying here. The WiFi had acceptable signal; once we figured out the password. The next morning we slept-in slightly, the campsites were virtually empty. Expect there to be a line getting into Devils Tower; which is directly in front of the KOA office. The park office staff provided fruitful recommendations on which path to travel with a trailer to our next destination. We would stay here again. We camped at Devils Tower / Black Hills KOA in a Travel Trailer. Nearest restaurants may be 26mi away, close to the interstate; plan accordingly. There were some nice features about this park; and yet, some undesirable features as well. PROS: Wooded area that added to the beauty of the camping experience. A large lake, viewable from many of the campsites. Mountains for a backdrop. Boat rentals onsite. CONS: 6+/- mile gravel road to/from the highway back top. Most of that ride is turns and twists through the burned out trees area from the '89 fire. The parks service grades the road of wash-boarding approximately every month; according to the park rangers, it had been a month since it was last performed. A bit pricey for water & electric only. Dumping station had a sign that said "Closed" each day we stayed. The wash-boarding vibration of the tow vehicle and travel trailer to the campground was severe enough, that when we got to our site and navigated the trees, we connected our water only to find that our water lines had worked loose causing a leak inside the trailer. Ouch; needed more tools than I brought! That changed the dynamics of our vacation in our new travel trailer. The last day we stayed, the parks service graded the road. This resolved the wash-boarding and provided a much smoother ride after check-out. Overall, I may stay here again, in a pinch and if the road was graded in the past two weeks. But, I would certainly look for alternative options first. Staff was nice. Before making a reservation, be sure to ask when the last time the road was graded. If it has been 3 to 4 weeks, you may want to reconsider. We camped at Madison Arm Resort & Marina in a Travel Trailer. I seldom ever give a perfect high score on any survey; this time, it was genuinely earned. This is the kind of RV park that others park owners should visit just to see what it looks like when it is done correctly. The park was clean; not just the bathroom/showers...the entire park! The streets, fencing, buildings were in excellent shape. My family felt safe. Yes; it was the most expensive RV park for this entire trip...honestly, I would have gladly paid more. We tried to extend our stay by two more days, we loved it that much. But, this was peak-season and no one was canceling their reservations. Plan your reservations well in advance with this place; clearly this park is 100% booked most of the busy season. We will most definitely stay here again. Highest recommendations! We camped at Yellowstone Grizzly RV Park & Cabins in a Travel Trailer. West Yellowstone, Idaho is a very nice small town for tourist. Plenty of restaurants, shopping, fuel, etc. And the entrance to the national park is on the east side of town. We stayed in five KOA's on this trip, most of which we were satisfied overall; however, this was our least favorite. Our main complaint was the potholes in some of the sites. The ladies in our group also reported that the restrooms and showers could have used more attention. We had a large and long pothole in our campsite; right where the full-hookups are. We struggled getting our travel trailer placed to avoid it. In all fairness, the pothole was filled with new rock. But, they used riverbed gravel to fill the limestone covered sites; which the riverbed gravel would not pack. The tow vehicle merely parted the riverbed gravel and caused a rut from tires; ultimately, either the trailer wheels or stabilizers would align with the pothole. We were left shoveling gravel back into the ruts. I asked the staff member that escorted us to our site about the pothole and riverbed gravel; he stated that the choice of the type of gravel used was based on the lower cost. I truly believe this pothole could have been resolved by using the same type of rock that the rest of the campground was covered with; something that would pack. The staff was very friendly; I think they were merely ill-advised or simply tried to save money in the wrong place regarding the efforts to resolve the potholes. We would likely seek out a different place stay next time. We camped at Rock Springs / Green River KOA in a Travel Trailer. Many nearby restaurants to choose from on either side of the interstate. Be careful towing a travel trailer between Rock Springs and Cheyenne in Interstate-80; the 35+ MPH crosswind gusts are clearly posted on the lighted marquee. And they are not joking either. I am very thankful we had sway control bar; our travel trailer is 5400 dry & 7400 gross...I think I'll brave this with two sway control bars next time. Overnight-only stay. Level sites; late check-ins welcome. Clean facilities; felt safe. Ate breakfast buffet the next morning in the park; very friendly staff. Would stay there again. We camped at Grand Island KOA in a Travel Trailer. Area restaurants are the next exit away in either direction; in some cases a mile or two off the interstate. 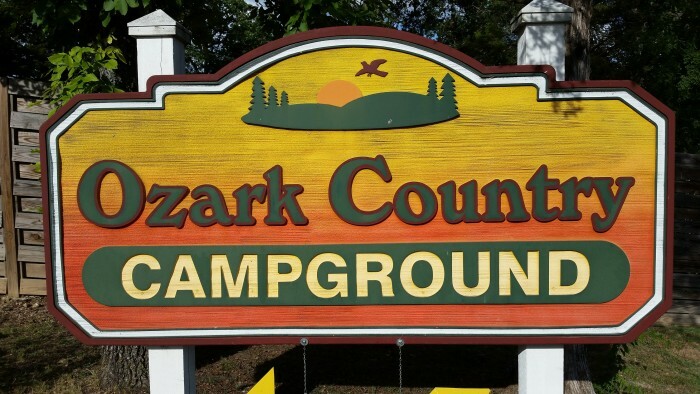 We selected to stay at this campground based on the impressive ratings on this site; we were very pleased with the grounds, amenities, customer service, cleanliness, location, and especially the price. Reasonably close routes to access to either end of the Branson strip. We were running late due to weather and we called to notify them; they patiently waited for us to do a late check-in. Very nice staff; we're new to RV camping, they were extremely informative and even helped guide us to our site and coached us while backing in. We will definitely camp here again; and refer our family and friends to do the same. 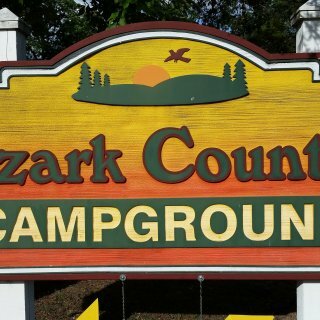 We camped at Ozark Country Campground in a Travel Trailer. Watch the tourist channel for Branson; many good ideas presented.